This collection of Weird Western stories has several crossovers. In "Stuff of Dreams," set in March 1875, Haakon Jones is lured into a blizzard by a beautiful red-golden haired girl. It is suggested that Ithaqua may have caused the blizzard. The girl is clearly Atali, the title character of Robert E. Howard’s Conan story "The Frost Giant’s Daughter." It is possible that the frost giant and Ithaqua (from August Derleth’s Cthulhu Mythos story of the same name) are the same being. In "Belfry's in Your Bats!," set in August 1876, Jones thwarts a bizarre plot on the life of President Grant. He is assisted by a Secret Service agent named Jim who dresses in a tight suit and vest, and carries an explosive material in his boot heel. Jim is Jim West from The Wild Wild West. In "A Knight Does Not a Pawn Make," set in 1877, Jones finds himself on the opposite side of a range war from an expensive hired gun. The man is unnamed, but dresses all in black, has a holster decorated with a silver chess knight, charges $1000 for his services, quotes classical authors, and gives his address as the Hotel Carlton in San Francisco. The hired gun is Paladin from the television series Have Gun – Will Travel. In "Surf City, Here I Come," set in 1889, Jones is a passenger aboard a ship that encounters the island of R’lyeh in the South Seas. Haakon fights the Deep Ones and briefly glimpses Cthulhu. In "The House of a Thousand Mirrors," also set in 1889, Jones nearly loses his soul to a witch’s enchanted mirrors in Deadwood. The mirrors are clearly meant to be those seen in Robert E. Howard’s Kull story "The Mirrors of Tuzun Thune." In Howard’s story, Tuzun Thune is assisted by a girl. Rick Lai speculates that the witch who encountered Haakon Jones is an older version of that same girl. In "Action on Arkham's Boot Hill," set in 1904, Jones visits Arkham, Massachusetts, where he meets Miskatonic University student Ward Phillips. A character named Ward Phillips appeared in H.P. Lovecraft and E. Hoffmann Price’s "Through the Gates of the Silver Key." Phillips was based on Lovecraft himself, whose full name was Howard Phillips Lovecraft. 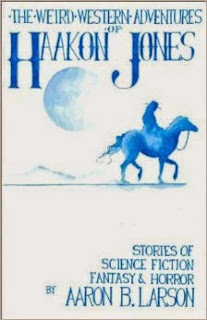 If Lovecraft and Price’s Phillips is the same person as the Phillips who encountered Haakon Jones, he must be a few years older than Lovecraft, who was only fourteen years old in 1904. Isn't there some kind of link between Haakon Jones and Indiana Jones? Possibly - Haakon has a son named Henry who was raised in England, who might have been intended to be Indiana Jones' father, but that doesn't work chronologically, as Matthew Baugh pointed out in the Twisted Trails of the Wold West article. That was probably what I was thinking of. Maybe they were related some other way.